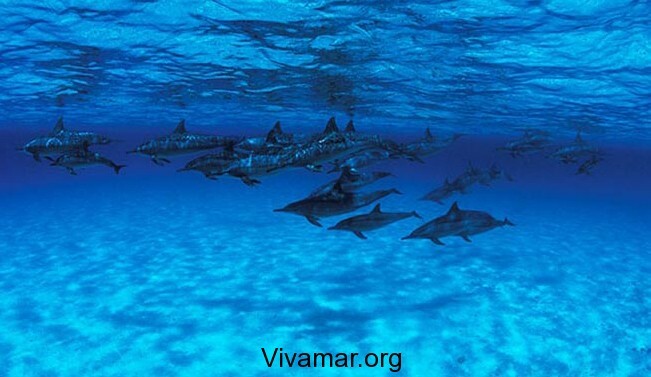 Dolphins hunt, survey surroundings, avoid predators, and navigate in murky or dark waters using echolocation. Echolocation consists of clicks, squeaks, creaks, buzzes, and whistles produced as air is pushed past the dorsal bursa of a dolphin’s nasal region. All of these sounds are characterized by high-frequency sound waves. Dolphins, other odontocetes, and many species of bats produce these sound waves and then receive and interpret the resulting echo which is formed when the sound waves come into contact with an object. 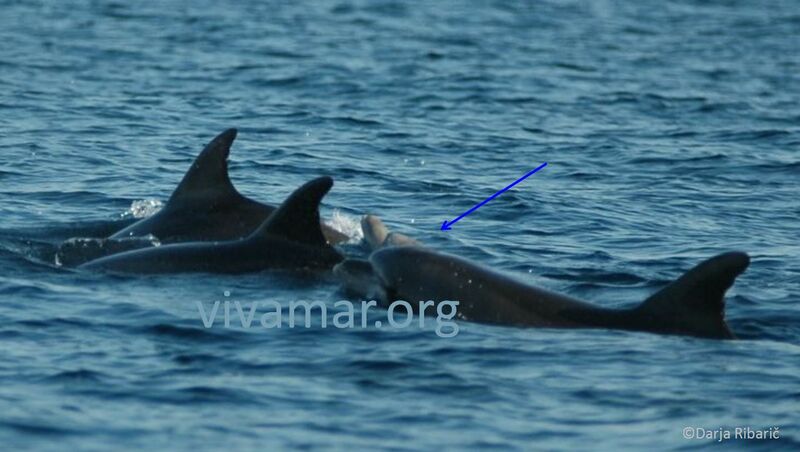 In dolphins, the main area of sound reception is in specialized lipid structures of the jaw-bone. Characteristics of the outgoing and incoming information are integrated to give the animals an accurate representation of an object’s location, shape, density, and velocity. Dolphins can also communicate using high-frequency sounds by a complex system of whistles and squeaks. The highest frequencies (between 40 and 150 kHz) are used mostly for processes listed above, but vocalizations ranging from .2 and 50 kHz are used in social communication and interaction. 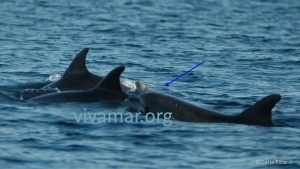 Dolphins have their own unique signature whistles (5 to 20 kHZ) with newborns acquiring their own around 1 month of age. Signature whistles can be used to identify each other and maintain group cohesion. Schools of dolphins might come to aid an injured dolphin when hearing calls and help it, keeping it at the surface so it can breathe. Many times from Vivamar’s obervation there is a single animal seen, the so called ‘scout’ that is inspecting/searching for food. 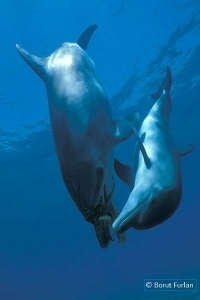 Such animals are often in acoustic connection with their conspecifics, and if they find food may call other group members to join in feeding. Dolphins in general are long lived animals. Bottlenose dolphins have a lifespan that can exceed over 50 years for females and up to 45 years for males. They are a very social species and often travel in groups called pods that differ in size, varying on average from 2 to 15 individuals. In the northern most Adriatic sea, we notice groups comprised of just two animals, but the average for Slovenia is 8,4 animals (Vivamar observation). Offshore groups might have up to several hundred individuals. Along the west coast of Istria (Croatia), we consistently observe bigger groups with a mean of 12,4 animals. 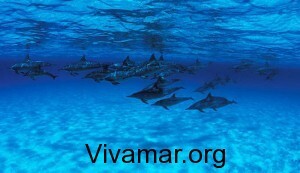 In general, smaller groups of dolphins will further aggregate to much larger groups. These aggregations are often connected to the seasonal availability of prey and conspecific cooperation in activities regarding the prey sources. Populations can travel long distances in search of prey. 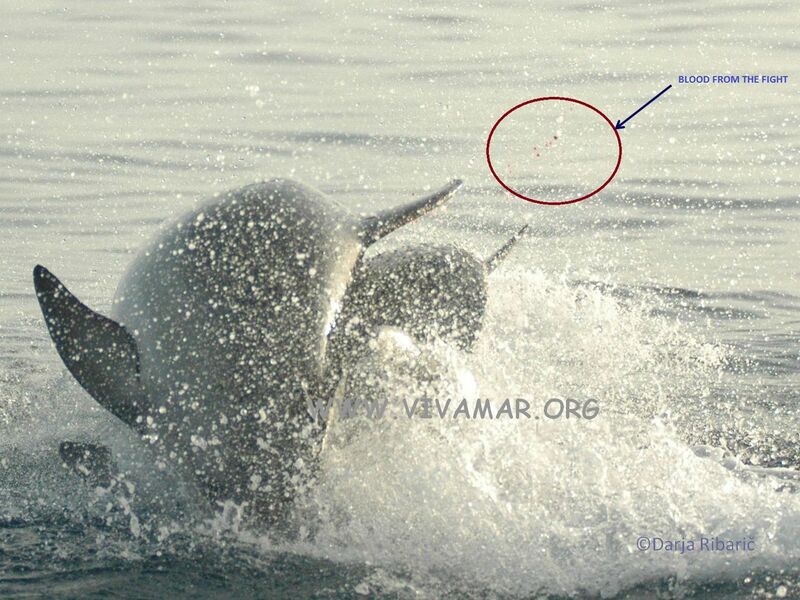 A serious fight between bottlenose dolphins in the research area. A baby dolphin swimming next to its mother.